Adrenaline junkies can easily be accommodated in the Bahamas. Get your fix on a shark dive. Whether you choose a cage dive with tiger sharks or to watch a feeding with Caribbean reef, bull, and nurse sharks, you are guaranteed excitement, not to mention fantastic photographic opportunities. The name Bahamas is derived from the Spanish words for shallow seas, baha mar. Anyone who has had the pleasure of cruising in the Bahamas knows that navigating the shallows can be as stressful as a minefield. The archipelago is comprised of about 700 islands and cays scattered along 500 miles of limestone platforms called the Great and Little Bahama Banks, divided by deep channels. This combination of deepwater, shallows, and mangroves, which are perfect nurseries, plus itâ? ?s proximity to the Gulf Stream and the Tongue of the Ocean makes the Bahamas host to a rich and diversified marine life. In my four years spent as a cook on a dive boat in the Bahamas, I got to dive with a great number of sharks. 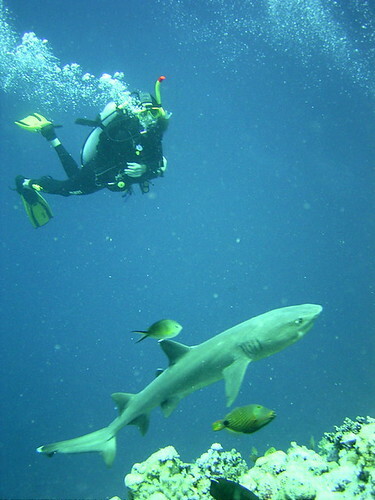 In fact, my first dive in the Bahamas was a shark dive. I had started my open water certification in the Pacific Northwest and arrived in Miami Beach ready to finish the course in warm water. The night before boarding the dive boat, I got food poisoning at a Cuban restaurant. So I spent the first two days on the Cay Sal Bank suffering from severe digestive distress. I finally felt well enough to get in the water just in time to sign waivers for a shark feeding dive. There I was, doing fin pivots and mask clearing with sharks and barracuda swirling around the top of the blue hole. Talk about trial by fire. I never would have guessed that a few years later, Iâ? ?d be helping lead shark feedings, or shooting video of the passengers enjoying their first shark experience. We first encountered the tiger sharks of the Little Bahama Bank while waiting for a pod of dolphins to show up. We once even put a group of Japanese swimmers in the water with a tiger thinking we had a pod of dolphins – oops! It turns out there are a lot of tigers in the area. Though they are known as man eaters and omnivores, tiger sharks in the Atlantic seem to be less aggressive than those found in the Pacific. Tiger Beach was formerly known as the Dry Bar but obviously deserves itâ? ?s newer name! Dive operations out of Grand Bahama, and liveaboard dive boats offer shark encounters at Tiger Beach both as cage dives, and free swimming. I spent a week at Riding Rock Inn on San Salvador and dove with small schools of scalloped hammerheads every day. These creatures are strange looking, almost alien, but so beautiful. Iâ? ?d still love to see the massive schools of hammerheads off Costa Rica or in the Galapagos, but the experience at Riding Rock was a fraction of the price and diving on a small boat with just a few people made it very intimate and enjoyable. Several dive operations including Stuart Coveâ? ?s, Nassau Scuba Center, and Dive Dive Dive, all offer shark feeding dives at sites called the Runway, Shark Arena and Shark Buoy. Divers are positioned and then a designated shark feeder, wearing either a full suit of chainmail, or a long chainmail glove, will feed twenty or more Caribbean Reef sharks directly in front of the divers so they can get great photos. Some places offer a short course preparing divers to assist in the feeding. At Shark Buoy, a spot Iâ? ?ve yet to visit, about an hour away from New Providence, divers get close to a large school of Silky sharks. Bethany White is a travel fanatic and wandering writer who is loves to dive and see the ocean as much as possible. She recently took some time off to stay at severalÂ island resortsÂ and is compiling a book that details the best vacation spots around.